I'm generally up for trying out continuity series, because there's something so fun in seeing the way authors/publishers tie the ideas together, and I feel safer trying out new authors in this way. When I heard that Barbour was releasing a new series based on American history, of course, I was excited to start reading it! 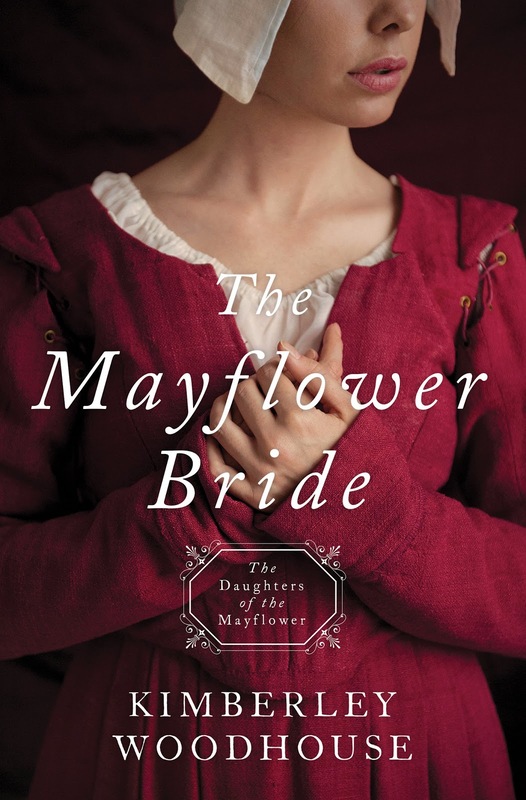 The first book of the Daughters of the Mayflower series is easy to place timewise, considering it's titled The Mayflower Bride. I really loved this time period as a child, so I've read all sorts of books on it. In many ways, it was a review session for me, and it was pleasant to find some familiar events replayed. I felt that the interactions with the historical figures were well handled and felt believable in the context. I also liked the heroine, Mary Elizabeth, and her friend Dorothy. The actual parts relating specifically to the Mayflower were very carefully researched. The cramped quarters and the stormy seas were colorfully displayed, as well as the sickness that resulted from both cramping and storms. Two comments jumped out at me. Pneumonia was mentioned as a diagnosis; the treatment that was prescribed wouldn't have helped, the disease wasn't even recognized for another century at least (official discovery in 1882), the possibility of catching it twice in a year would have been a sure death warrant with lungs already weakened by the first round. Also, there's a comment made that a profane sailor should have his mouth washed out with soap. This punishment wasn't heard of until the 1830s and wasn't at all common until the latter half of the nineteenth century, a full two decades later. Why? Because that's when bar soap (as opposed to soft soap) became more widespread. A more accurate treatment for profane men and one which Captain John Smith used was to dump a bucket of cold water down their arms or over their heads. I felt like sometimes the plot was a trifle cramped by the historical boundaries, but I was quite impressed that the author didn't force the facts to conform to the story. Rearranging history to fit a fictional tale drives me nuts, and it was a relief that this book didn't do so. Most of the characters were colorful and interesting, and the only one that didn't have much usefulness as a person was a certain person who had an antagonistic role, which seemed to me to be mainly a distraction from the characters I wished to continue watching. This is a difficult one to comment on. The author's comment in the preface states that she felt it would be offputting to include too many "thees" and "thous", and decided to write with a more modern tone. With a statement like that, I feel overcritical even mentioning it, but I think the modernization wasn't successful. Instead of modernizing specific words and terms and leaving more of the flavor of the original speech style, the everyday speech feels more late-Victorian, interspersed with lengthy Scripture quotations from the old 1611 Bible. The two in conjunction could feel jarring. Also, I found the editor's decision to use ampersands in the Bible quotations when said aloud to be extremely distracting and offputting. Why not spell it out as it would sound spoken? I don't get the logic behind that. The conversation also included some clichés and turns of phrase from later times, rather than using more literal terms that would have expressed the time period better. Content: Some descriptions of illness/death. Christianity: Lots of quotation of Scripture; clear message to "have faith"; but we also have a strong Christian heroine starting to fall for a man before he begins to believe. I will continue to read the Daughters of the Mayflower series. I would recommend The Mayflower Bride for ages 16 and up. Purchase The Mayflower Bride on Amazon.